Whether you are looking to purchase a newly restored piano, or looking to have your own vintage piano refurbished inside and out, you can rely on the pride and craftsmanship of Barbara Martin Piano to give you an instrument that will provide years of enjoyment. Barbara Martin Piano now offers 100% wool, handmade and handcut Dawson String Covers for your piano. "Invest in the protection, life and joy of your piano today". 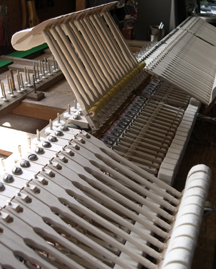 The process of repairing or renovating a building, work of art, vehicle, etc., so as to restore it to its original condition: Barbara Martin Piano can restore your baby grand piano. Build (something) again after it has been damaged or destroyed: rebuild your piano for years of enjoyment. 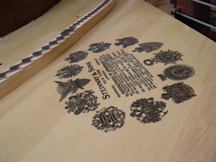 Renovate and redecorate (something): refurbish your piano to protect your investment.